"To anybody thinking of getting involved with this growing movement, I would highly recommend it. It’s the perfect opportunity to make a difference locally." “Why did you get involved?” people often ask, and my answer is always the same - to share my experiences, make a difference (no matter how big or small) and encourage others to speak out themselves. It began when I signed up in April this year and I am pleased to say the last six months have included some of the best experiences of my life! Through following someone in the mental health community online, I came across a tweet regarding Time to Change. Something about it intrigued me, so I decided to check out the website. Within minutes of looking, the countless opportunities and stories I encountered made me incredibly inspired and motivated to get involved. Mental illness is something I have personal experience of and so I believed it would be a perfect way to make a change for the better and channel my negative emotions into something more positive and worthwhile. Once signed up, I decided to email and meet my local coordinator in the Blackpool Hub and find out more about how exactly I could be involved. 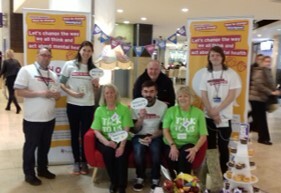 I attended a number of Time to Change training sessions, all of which have been useful and allowed me to gain a better understanding of how to approach campaigning, better engage with people when doing events in the community and meeting with local partners and organisations. The social contact training was very good because it made me feel better prepared in running events and more confident in having conversations with people about mental health. 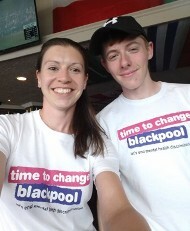 Once I became involved I was asked to promote the hub via social media, in the form of Facebook and Twitter, to increase interest in Time to Change Blackpool and what we do. Having seen a massive rise in interaction on the page, it is clear the page is gaining more attention and that people in the area are starting to take more notice and place more importance on mental health. Much of what we post is around sharing our events and YouTube channel and we have noticed it has been a positive tool in increasing discussions among people and encouraging more people to share their stories, about their own experiences with mental health problems, without feeling ashamed. Although it has been largely positive, we have had some negative comments and it has been nice to see people challenging those beliefs on our page! One of my first ideas was to hold an “in your corner” roadshow whereby we would go into community spaces locally and talk to people about mental health. 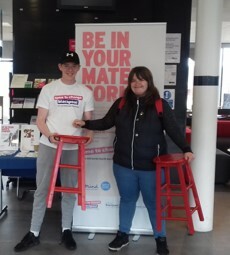 I had previously saw the in your corner ad online and so we decided to buy some stools and paint them like in the posters. In the space of one week, we visited a park, cinema, health centre, college and pub. Although our success was varied across each venue, it was hugely rewarding and satisfying to hear people’s stories and have more discussion and engagement with different types of people around mental health. It was also useful to learn new things about campaigning, particularly in the forms of location and times and knowing how better to approach planning something similar in the future. Should we do another roadshow in the future, I hope to do something “bigger and better” by visiting more venues and using interactive activities to engage with more people. With some people there was a reluctance to approach us and I think it is important to use things to draw people over! With World Mental Health Day fast approaching I decided to set up a champions campaigning group in our local area. I posted about this on our social media platforms to get people to join. The group now runs every two weeks on a Thursday night for an hour and the purpose is for champions to meet, share and discuss ideas about what we could do locally to challenge stigma. A local partner Horizon has a number of Time to Change champions and we now have a regular group of four or five people attending the meet-up and contributing ideas. Horizon, a local drug, alcohol and sexual health support service, that have been very active in promoting the time to change brand through events and have very much been a massive help in driving what we do throughout the local area.